I noticed this salad at my local Italian deli. I didn't buy any, but just looking closely, it was easy enough to figure out. 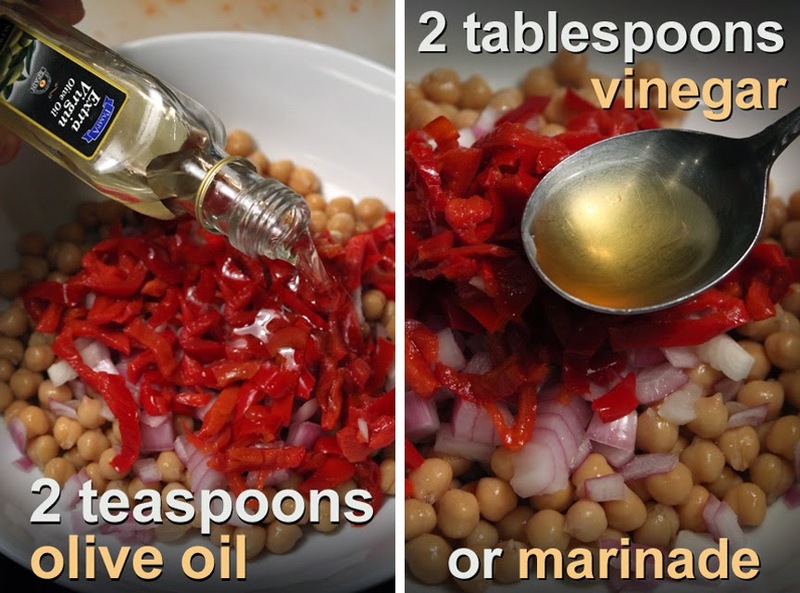 This bean salad is quick to make -- no cooking involved. All you need is a can opener and a good grip to twist open a jar of pickled sweet red peppers. 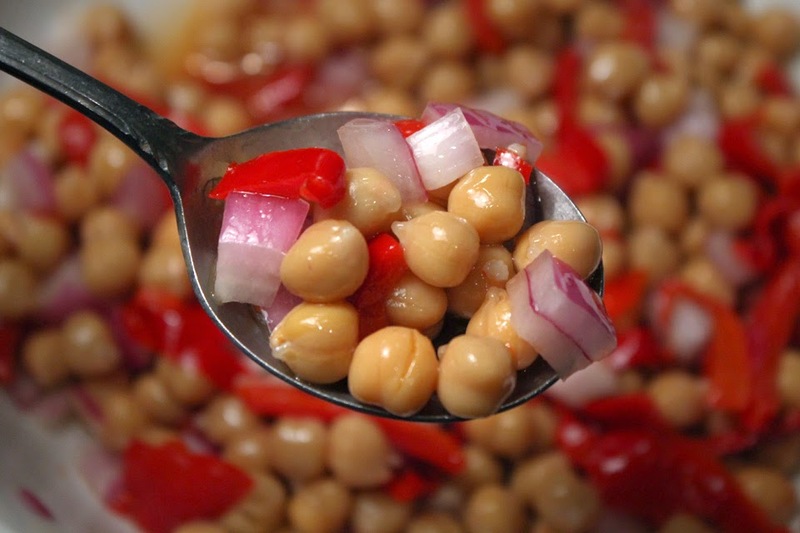 My Chickpea & Sweet Red Pepper Salad would go well with any favorite sandwich. You could also spoon it over a leafy salad to add more heft. And, of course, it's just plain good on it's own. 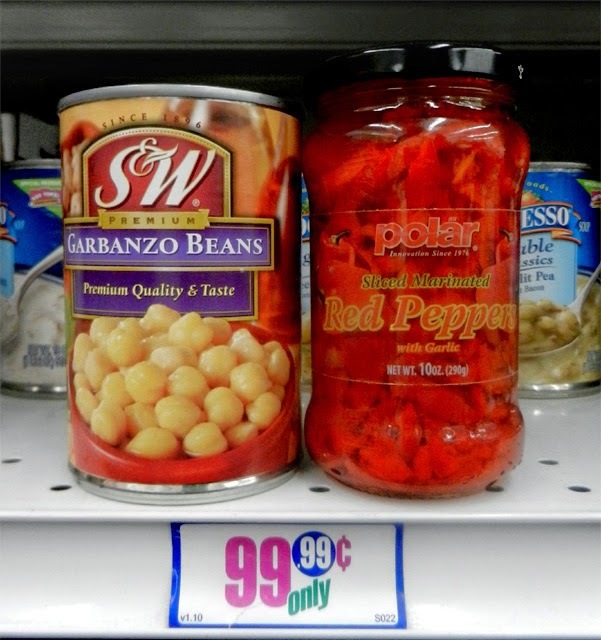 I like canned chickpeas, or garbanzo beans (they're the same thing.) 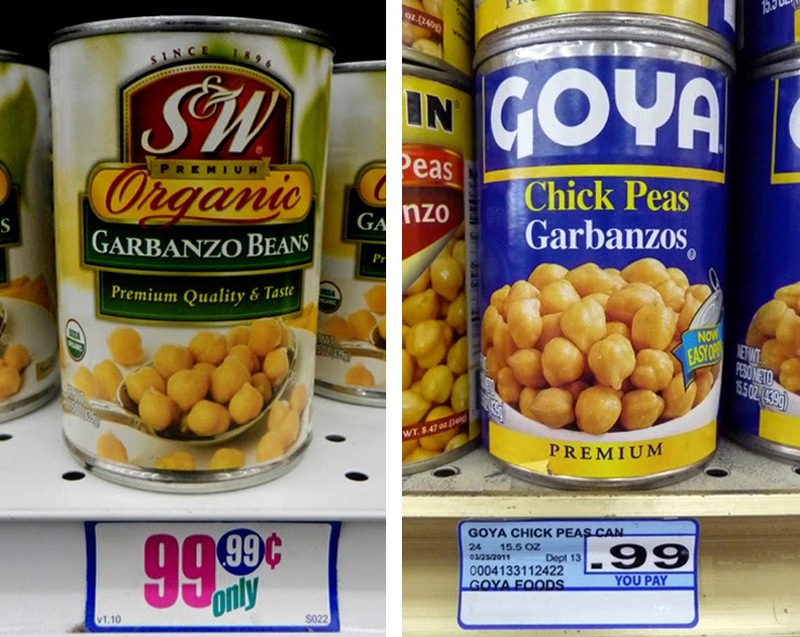 chickpeas are cheap, and lighter in flavor than other beans. 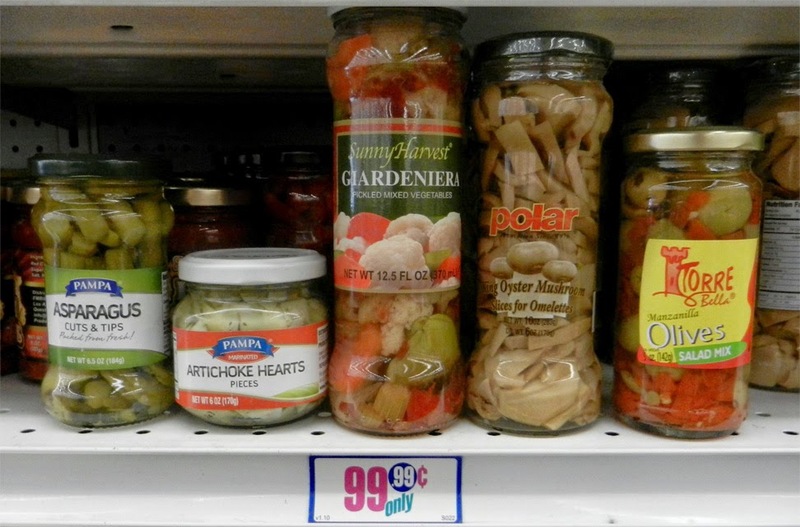 I often find jars of pickled veggies in my local 99c only Stores. I used sweet red peppers, but you could substitute (or add) any favorite pickled veggie you find on sale. 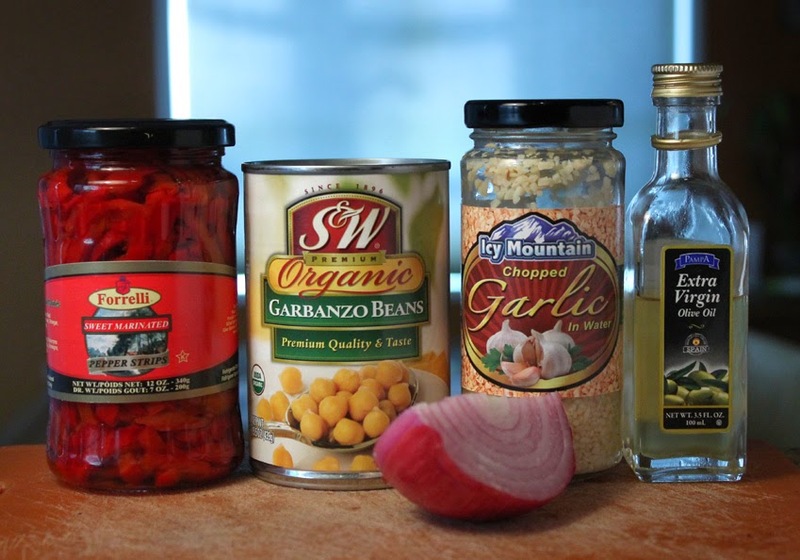 I also use red onion and a little garlic for this recipe. And I finish it up with some vinegar and olive oil. There's not much too it, but it's sure is tasty. 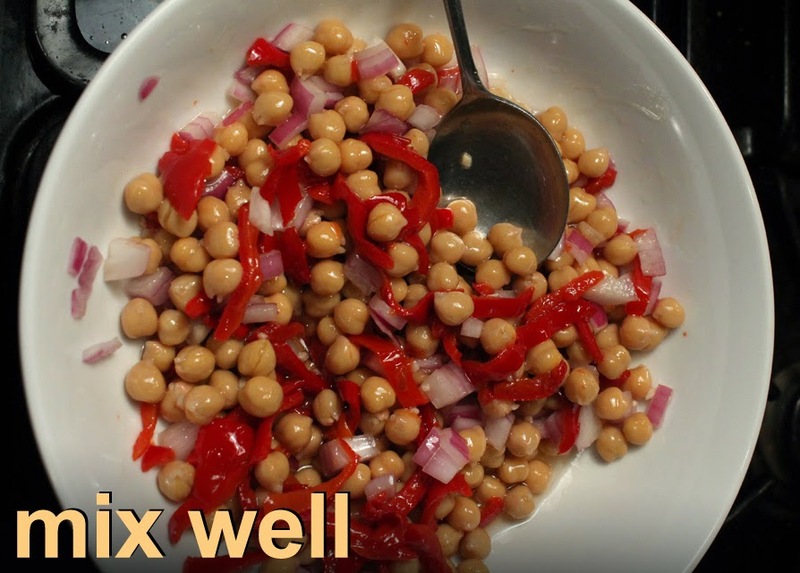 I like the tender chick peas and sweet peppers with the added crunch of chopped red onion - an excellent flavor combination. And if you are looking for an easy pot luck dish to take along, then bring my Chickpea (Garbanzo Bean) & Sweet Red Pepper Salad. It's also travels well to your next picnic or neighborhood party. Be sure to make plenty - it's even better the next day, once the flavors have melded. 2 cans chickpeas or garbanzo beans - drained. Each can was about 15 ounces. Close to 4 cups total. 1 cup sweet red bell peppers - I used half a 12 ounce jar of vinegar marinated sweet peppers. Okay to use more or less to taste. 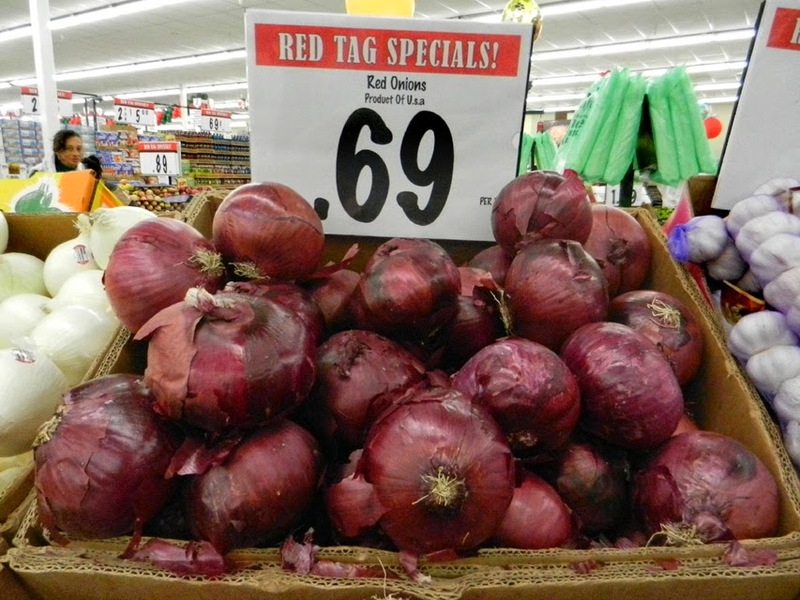 1/2 red onion - okay to use any cheap onion. 2 tablespoons of vinegar or marinade - I used the vinegar marinade from the sweet pepper jar. You substitute with fresh vinegar. Use any type: white, apple or rice vinegar. Okay to use less, to taste. 2 teaspoons of a favorite oil - I used olive oil. Again you can add more or less, to taste. Salt and pepper to taste - I only added a little black pepper, as canned and pickled ingredients have plent of salt for me. Drain cans of chickpeas. Sometimes the liquid drains easily, but I've had cans were the liquid is like gravy, so you need to empty the can and rinse off the peas. Add them to a large bowl. Add a teaspoon of chopped garlic, fresh or from the jar. My jar of sweet red peppers sliced into strips, so I just cut the strips into smaller pieces. Some sweet peppers come in large halves, so you may need to do a little more chopping; but since the peppers are cooked and tender, that's easy enough to do. Chop half an onion. I used a red onion for color and they are sweeter, but you can use any cheap white or yellow onion. I do a fairly fine chop. Add onion to peas, garlic and peppers. Finally add a favorite oil and vinegar (or pepper marinade.) Mix well. Season with salt and pepper to taste, if needed. 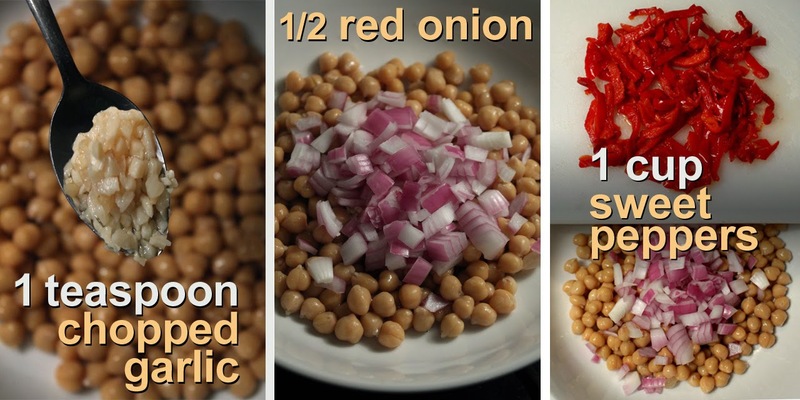 I used 2 cans of chickpeas for this recipe but it's easy enough to halve and just use one can. And, of course, reduce the other ingredients by half. If sweet red peppers are not on sale, it's okay to use almost any cheaply priced pickled veggies, like: mushrooms, olives, cauliflower, artichoke hearts, or a medley veggie mixture. If you have any fresh herbs, then add a chopped teaspoonful. My Chickpea & Sweet Red Pepper mixture is a tasty side dish, but can also add some of this protein to a leafy green salad.